Vulture Industries announce new European tour called "Strange Rain" dates this Spring! Vulture Industries have announced new European tour dates together with good friends Heilheim and Madder Mortem. The Norwegian eccentrics kick off the ”Strange Rain” tour at the Kvarteret in Bergen (NO) on April 12th and sees the band traveling throughout 6 more countries before a final curtain at the Skullcrusher fest in Dresden (DE) on May 4th. The metal scene seems mired in stagnation all too often these days. The tenth edition of the great thrash revival, the never-ending race to be more brutal or more technical or more dissonant in death metal, and the rampant nostalgia of an ever-aging scene do not provide the necessary ingredients for progress and out of the box thinking. That is the very reason why rare bands such as Vulture Industries are so important. The Norwegians fourth album ”Stranger Times” continues and expands the band’s quest to push the limitations of genre and sound. Their nine new tracks are as easily as masterfully spanning a wide range from dark rock to progressive-experimental metal, while keeping their wild roaming within the boundaries of the band’s unique and bizarre sonic universe. Yet Vulture Industires manage to harness their bold mix into recognisable structures and meaningful songs throughout that do not shy away from catchiness and, quite importantly, do not fall into the trap of being weird just for the sake of experimentation. Vulture Industries have emerged from the vibrant rock and metal scene of Bergen, the unofficial capital of Norway’s west coast. Mostly associated with black metal, its rich music sphere in fact covers bands from all styles and directions. 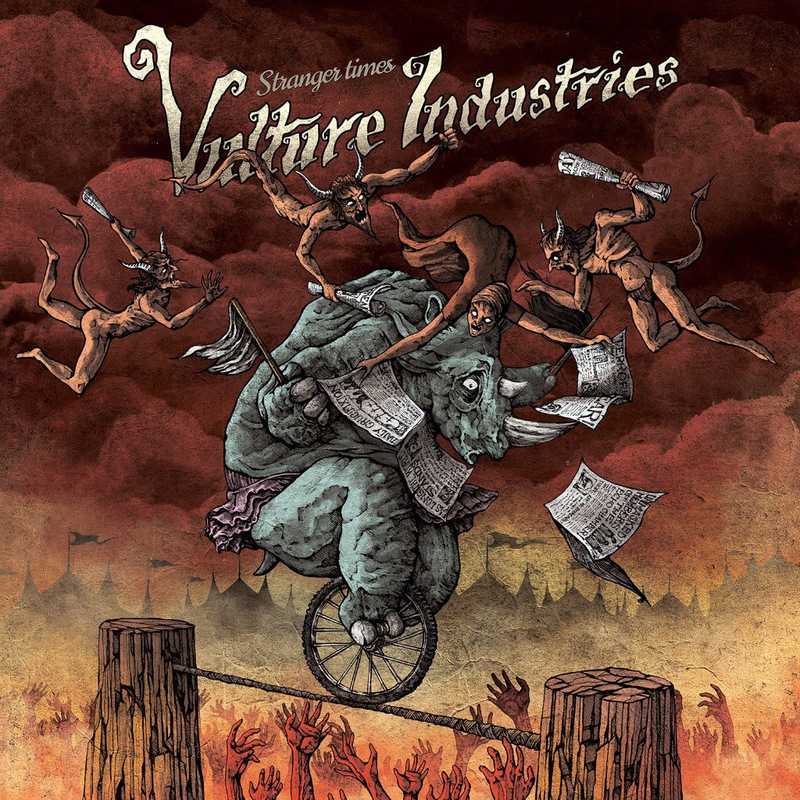 Vulture Industries drew inspiration from diverse acts such as Faith No More, Mr. Bungle, Arcturus , Devin Townsend, Ved Buens Ende and The Cult, when they started out under the Dead Rose Garded moniker in 1993. After several line-up changes, the new name Vulture Industries was adopted in 2003 and two demo releases quickly followed ”The Sleeper” (2003) and ”The Enemy Within” (2004). Having stirred considerable interest in progressive circles, it was time to present their first official recording with the Ep ”The Benevolent Pawn” (2005). Consisting of current and former members of Sulphur, Black Hole Generator, Malice In Wonderland, and Syrach, Vulture Industries shouldered their way past the then-inactive Arcturus and the drifting Ulvertowards the throne of Norwegian dark progressive metal with their two albums ”The Dystopia Journals” (2007) and ”The Malefactor’s Bloody Register” (2010). The eclectic band from Bergen was more than ready to engage with avant-garde metal fans worldwide, which their next full-length ”The Tower”aptly proved in 2013. This release saw expanded touring and more performances at prestigious festivals around the globe.